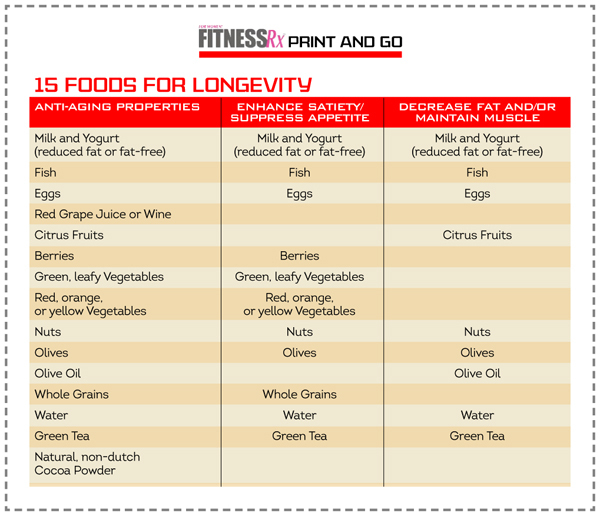 Nutrition Tips and the 15 Best Foods to Help You Feel Younger! Most of us have heard about the Fountain of Youth— a legendary spring that amazingly restores the youth to anyone who drinks from its waters. Look around and you’ll see plenty of examples of possible ‘fountain sippers’— people who look eternally youthful. In some cases, their appearance is an example of cosmetic surgery, and in other cases it’s the result of flattering camera angles, soft lighting and a flub or two in the age-reporting department. There’s only one way to look younger as we get older— and that’s by taking care of ourselves. Take a closer look at people who never seem to age. They exercise (see “Longevity Training“), stay active, eat a healthy diet and stay out of the sun. 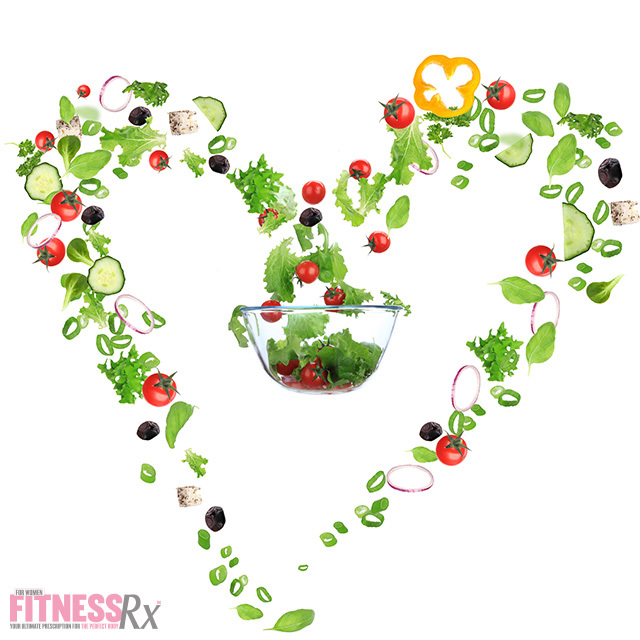 Here in Part 2 of the FitRx “Turn Back the Time” series, we share some live-longer nutrition tips and the 15 best foods to help you feel younger. Apart from living in Greece, you can still lead a Mediterranean lifestyle, by eating the foods they eat on a regular basis. Why should you eat like the Greeks? Because over the years, countless studies have proven that specific foods in the Mediterranean diet are linked to longer life, reduced risk of cardiovascular disease, cancer, type 2 diabetes, lower cholesterol and blood pressure, as well as reduction in the risk of being overweight or obese. If that’s not a good enough reason for you— then I don’t know what is! Eating like the Greeks is not as hard as it appears to be. There’s no reason to even mention the word diet, just consider this style of eating your new healthy eating habit. Make it part of your daily regimen. You’ll find the foods flavorful and satisfying, and quite frankly, easy. The foods most commonly associated with the Mediterranean diet are items like fish, cheese, yogurt, fruits, vegetables and grains, olive oil, nuts, legumes, seeds, herbs and spices, grape leaves and red wine. All of these foods have one thing in common and that is that they are nutrient-dense—meaning they are full of the vitamins, minerals, nutrients, and antioxidants our body benefits from. To build your Mediterranean menu, you’ll want to focus your meals around green veggies, fruits, beans, legumes and whole grains. These are the foods that will provide you with energy throughout the day. They’re also loaded with vitamins and minerals that will keep your immune system healthy, your GI tract moving along, and your metabolism burning. A good rule of thumb is to base at least half of your meal around these items. Then add some lean protein. Good sources of protein and ones most commonly found in the Mediterranean menu are fish and shellfish, eggs, lean beef, chicken and turkey breast, cottage cheese, protein powder, and even beans, lentils and tofu. It’s essential that you eat enough protein, because without protein, your body is unable to repair itself and stay young. Most cellular functions within the body rely on proteins (amino acids) to do the work. If there is no protein, you’ll have no bricks to build with. Protein is also associated with metabolism and your body’s ability to burn fat. Many people are unsure of exactly how much protein they should be eating per day. The palm of your hand is a good measure of portion size per meal. To complete your meal, you’ll want to include healthy fats such as cheese, olive oil, nuts and seeds. High-fat foods found in the Mediterranean diet are mostly unsaturated (the good fats) consisting of polyunsaturated and monounsaturated fatty acids like Omega-3s, 6s and 9s, and CLA. The right types of fat will help our bodies burn fat, as well as provide defense against cancer and prevention of diabetes and heart disease. The average portion size of fat is not much (about 1 tbsp per meal x 4-5 meals per day) because fats are calorically dense, with 9 calories per gram. 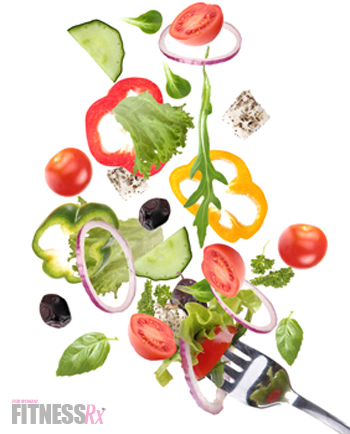 Try drizzling olive oil on your salad, or top with some feta cheese; these are both delicious and nutritious options. If Monkeys Can Do It, So Can You! The average American lives to be only 70. If you’re in your mid-30s, that means you’re quite possibly already halfway through your time on earth. A recent study of aging was performed on monkeys, suggesting that following a reduced-calorie diet that contains 30 percent fewer calories than usual could potentially fend off the usual diseases associated with aging and in turn, extend your lifespan. Many people have a hard time conforming to a 30 percent reduction in their daily caloric intake; in those cases you can look to supplements like Resveratrol, which is found in red wine, which potentially duplicates the effects of a caloric-restricted diet. More studies need to be done in order to determine whether or not caloric restriction is the way to go, but until then, include anti-aging foods in your diet on a regular basis and you’re surely adding a few more years to your life. Robertson, R. M. and L. Smaha (2001). “Can a Mediterranean-Style Diet Reduce Heart Disease?” Circulation,103(13): 1821-1822. (2009). “The Mediterranean Diet and Cardiovascular Diseases: Translating Research Findings to Clinical Recommendations.” Nutrition Today, 44(3): 134-135 10.1097/NT.0b013e3181ab46a8. (2006). “The Effects of a Mediterranean Diet on Risk Factors for Heart Disease.” Ann Intern Med, 145(1): I-11-. Trichopoulou, A., T. Costacou, et al. (2003). “Adherence to a Mediterranean Diet and Survival in a Greek Population.” N Engl J Med, 348(26): 2599-2608. Sloth, B., A. Due, et al. (2009). “The effect of a high-MUFA, low-glycaemic index diet and a low-fat diet on appetite and glucose metabolism during a 6-month weight maintenance period.” British Journal of Nutrition, 101(12): 1846-1858. Kratz, M., H. Callahan, et al. (2009). “Dietary n-3-polyunsaturated fatty acids and energy balance in overweight or moderately obese men and women: a randomized controlled trial.” Nutrition & Metabolism, 6(1): 24. Brochot, A., M. Guinot, et al. (2009). “Effects of alpha-linolenic acid vs. docosahexaenoic acid supply on the distribution of fatty acids among the rat cardiac subcellular membranes after a short- or long-term dietary exposure.” Nutrition & Metabolism, 6(1): 14. Kerksick, C., A. Thomas, et al. (2009). “Effects of a popular exercise and weight loss program on weight loss, body composition, energy expenditure and health in obese women.” Nutrition & Metabolism, 6(1): 23. Mullins, N. and W. Sinning (2005). “Effects of resistance training and protein supplementation on bone turnover in young adult women.” Nutrition & Metabolism, 2(1): 19. Kerksick, C. and B. Leutholtz (2005). “Nutrient Administration and Resistance Training.” Journal of the International Society of Sports Nutrition, 2(1): 50-67. Brown, E., R. DiSilvestro, et al. (2004). “Soy versus whey protein bars: Effects on exercise training impact on lean body mass and antioxidant status.” Nutrition Journal, 3(1): 22.